Very Long Fiber (VLF) compounds exhibit excellent price-to-performance characteristics and are routinely considered as a cost management alternative to higher density and higher cost reinforced compounds. VLF polypropylene compounds can be used as drop-in replacements for nylon compounds because they can meet physical performance requirements, offer processing advantages and can be used in existing molds with little or no alterations. 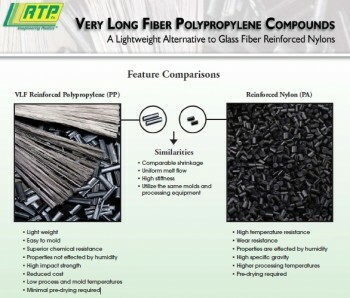 In addition, polypropylene maintains its physical properties in high humidity. VLF reinforced polypropylene compounds have a lower specific gravity than reinforced nylons, resulting in more parts per lb/kg of material purchased. This cost and weight reduction is appealing to processors and OEM’strying to reduce costs.